Advocates note that Democratic-leaning groups are disproportionately affected by strict voter roll maintenance systems like Ohio's. After the Supreme Court upheld Ohio's aggressive methods of pruning its voter registration rolls Monday, a triumphant Republican Secretary of State Jon Husted suggested other states look to it as a model. That's exactly what voting rights advocates are afraid of. "If you're a state that wants to get in the business of progressively purging your voters, they have a green light to essentially to copy the Ohio system," Paul Smith, vice president of Campaign Legal Center, said in a call with reporters Monday. He noted that minorities, lower-income, and younger voters — all Democratic-leaning groups — are disproportionately affected by strict voter roll maintenance systems like Ohio's, which boots people after they don't vote in a few elections and fail to respond to a mailed notice, even if they would otherwise be eligible to vote. "The opinion is going to encourage other states to enact purge practices like Ohio’s that are going to result in voter suppression around the country," Vanita Gupta, a former Department of Justice official who oversaw voting rights enforcement in the Obama administration, told NBC News Monday. She is now president and CEO of the Leadership Conference on Civil and Human Rights. Ohio is one of seven states with voter purge processes that weigh voter inactivity in voter roll maintenance, and more than a dozen other states have indicated they would like to adopt the same system. America’s voter rolls are undeniably messy — the system was set up to get voters registered, not to remove them after they die or move out of state — and most people agree they need cleaning. How that is accomplished, however, is a matter of contentious debate: Republicans champion aggressive voter purges that sometimes use voter inactivity as an indicator of ineligibly, often citing the still unproven threat of widespread voter fraud. Democrats and voting rights advocates say the clean-up process must protect eligible voters, and argue that aggressive voter purge methods disproportionately target minority and low-income voters. Democrats, too, are more infrequent voters. Many states review change-of-address data through the Post Office to update voter rolls, but Ohio and six other states have voter purge systems that use nonvoting as an indicator of ineligibility in some way. The Buckeye State’s "supplemental process" system — which was at issue before the Supreme Court — is the nation's most aggressive: Voters who do not cast a ballot for two consecutive years (one federal election, in most cases) are declared inactive and sent a mailer asking them to confirm their voter registration. If they don't respond or vote in the next four years, they are removed from the voter roll system. The plaintiff in the Supreme Court case, Navy veteran Larry Harmon sat out the 2010 midterms, the 2012 presidential election, and the 2014 midterms. Because of it, he was barred from casting a ballot in a local 2015 election. The state says they sent him a notice to confirm his voter registration, but Harmon does not recall receiving it. States adopting more aggressive voter purge systems seem likely to earn the Trump administration's support, too. The Department of Justice reversed its stance on the Ohio system last year, tossing out the Obama administration’s opposition and filing a brief supporting it in the Supreme Court case. Last summer, the DOJ also called for detailed voter roll maintenance records from 44 states in a broad and unusual request, spurring speculation that it would push election administrators around the country to aggressively clean up their voter rolls. Still, voting rights advocates were quick to note that the Supreme Court ruling does set a precedent for the voter protections Ohio's system does include, like notifying voters before purging them and mandating a waiting period before removal. 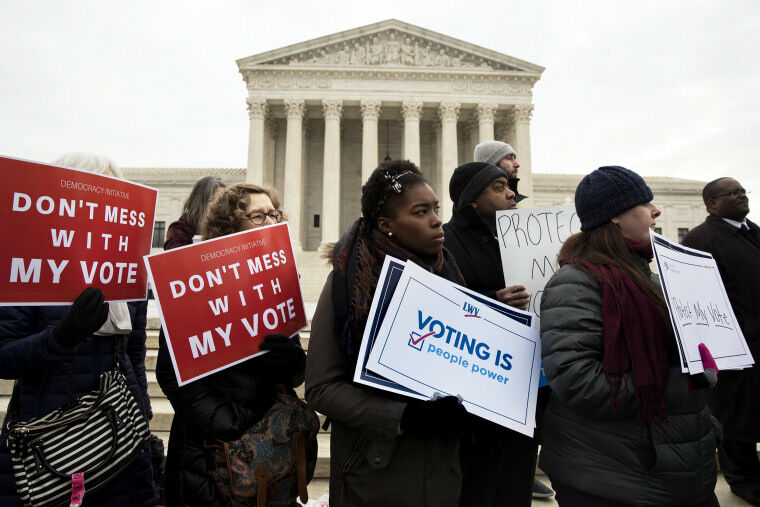 "This ruling is a setback for voting rights, but it is not a green light to engage in wholesale purges of eligible voters without notice," said Dale Ho, director of the American Civil Liberties Union's Voting Rights Project, in a call with reporters. Advocacy groups including Demos, the ACLU and the Brennan Center for Justice at New York University said they would continue to fight against the removal of eligible voters from voting rolls. Stuart Naifeh, senior counsel at Demos, said he believes another lawsuit could be brought on the Ohio purge system’s discriminatory effect, giving voting rights advocates another shot to end the practice. Supreme Court Justice Sonia Sotomayor, in a scathing dissent, pushed states not to follow Ohio's example. "States, though, need not choose to be so unwise. Our democracy rests on the ability of all individuals, regardless of race, income, or status, to exercise their right to vote. The majority of States have found ways to maintain accurate voter rolls without initiating removal processes based solely on an individual's failure to vote,” she wrote.